Someone posed me a question : in the formulae of sexuation Lacan says that men totalize themselves with the phallic function : ("x) Φ(x), and that this totalization is based on the exception of the paternal function : ($x) ØΦ(x). How can we understand that ? What does it mean exactly that the paternal exception makes possible the set of men ? where the symbol Ø is the symbol of negation. If we see those formulae in the way of ordinary symbolic logic, they are simply contradictory. So we need another way of interpretation of them. But the phallus Φ of the masculin ego ideal is only possible in its correlation with the impossible phallus of the Father (Urvater) ØΦ(x) which could realize the impossible sexual relation (of course that is impossible). The formula ØΦ(x) is not a simple negation of Φ(x). The paternal phallus ØΦ is impossible and ex-sistent to the phallus Φ of sons. So we should read the formula ($x) ØΦ(x) in this way : for men it is supposed that there ex-sists x which has the impossible phallus of the impossible sexual relation. 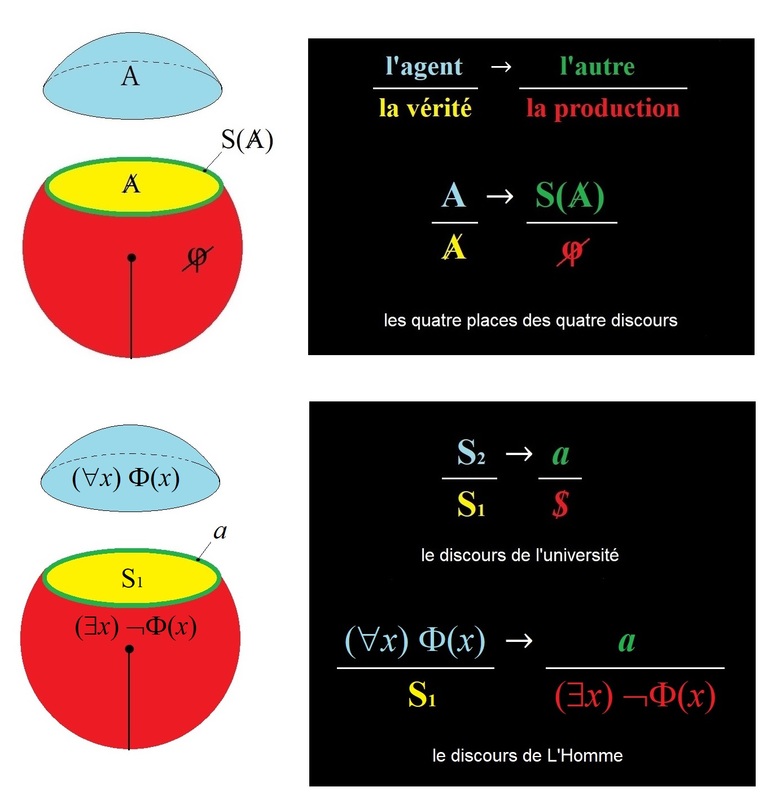 About the formula ("x) Φ(x) Lacan says in L'étourdit (Autres écrits, p.458) : « tout sujet (...) s’inscrit dans la fonction phallique pour parer à l’absence du rapport sexuel » [ every subject is inscribed in the phallic function to cope with the absence of sexual relation ]. In Freudian terms we can say : the phallus Φ as the male ego ideal is Verleugnung of castration. It covers and hides the ex-sistent and impossible phallus ØΦ of the dead Urvater. The phallus Φ is what is in stake in the masculin protest at the last moment of analysis of male patients, as Freud says in Die endliche und die unendliche Analyse. 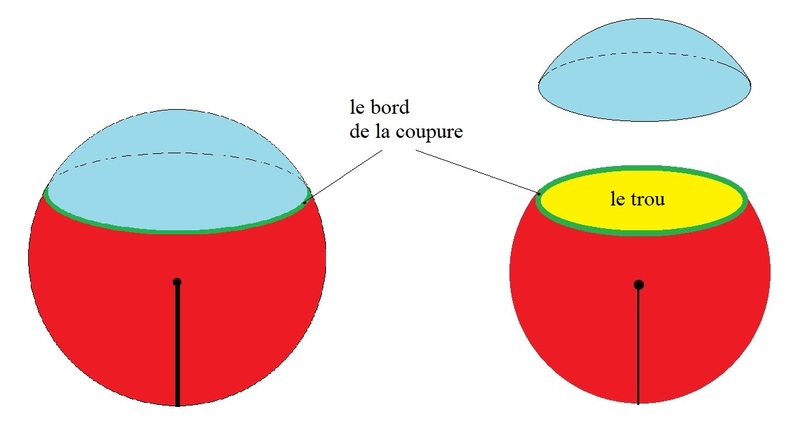 where the figure of the left side is the cross-cap cut into a discoid surface (blue) and a Möbius surface (Möbius strip, red).